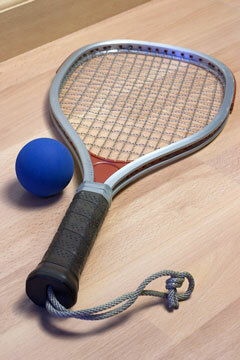 Racquetball is a fast-paced game which is played on an enclosed rectangular court. Using a short-handled racquet, each player attempts to hit the racket ball in a manner that his opponent cannot return. Racquetball was developed around 1950 at a Greenwich, Connecticut YMCA by a professional tennis and squash player and rubber company executive named Joe Sobek. Joe developed a short, strung racket which he called a paddle racket and designed a hollow rubber ball for use on the YMCA's indoor handball courts. Sobek actively promoted the new sport himself for about 15 years. Finally, in the late 1960s, it became known as racquetball when U.S. Handball Association founder Robert Kendler became interested in the sport and founded the International Racquetball Association (IRA). Racquetball racquet technology has come a long way since Sobek's early prototype racquets. They are now made with lighter materials and feature vibration dampeners and custom grips. Racquet prices range from about $20 on up to $300 for a custom, high tech racquet. Besides a racquet, you will need balls designed for racquetball play, as well as eye protection and possibly racquetball gloves and white or clear soled court shoes. Each racquetball player must wear a wrist strap, attached to the end of the racket handle, to prevent the racket from leaving the player's possession and hurtling through the air. This sporting goods store chain offers a broad selection of racquetballs, racquets, racquet string, and tennis accessories. Maker of racquetball equipment, clothing, and accessories, including a broad selection of racquets. California-based designer and manufacturer of performance racquets and accessories. This sports equipment manufacturer features racquetball racquets, strings, grips, eyewear and accessories. This manufacturer of sports equipment focuses on making technologically advanced products which help the average player play better.